It's been a slow start for Australia in what is supposed to be the Asian Century. Despite being tipped off as early as the 1980s, our leadership at times seems to have been caught by surprise, frantically looking around for Britain and the US like a teenager trying to use a washing machine for the first time. Australia failed to land an impact at either the Asia-Pacific Economic Cooperation (APEC) Summit in Da Nang, Vietnam, or the East Asia Summit held in the shadows of the Association of Southeast Asian Nations (ASEAN) Summit in Manila at the start of November. Given the attendance of US President Donald Trump as part of his first official visit to the region, it was unlikely an Australian leader would garner much attention even if they weren't focused on the domestic troubles plaguing Prime Minister Malcolm Turnbull. The events were a wasted opportunity for Australia, which has long held a bipartisan policy of ever-increasing engagement with Asia. Trump's apparent total disinterest in foreign affairs has created gulfs around the world as the US turns inward, heralding a refreshing shift in the traditional world order. Globally, the focus of this has been on India and China, particularly in Asia, but Australia is facing prime conditions in which to move beyond the safe realms of trade and soft power lip service. While Trump is more popular in Southeast Asia than perhaps anywhere else in the world, with US-based commentators positing this popularity can be put down to decades of destructive US foreign policy in the region and the view Trump truly is an 'outsider', he has so far refused to wield that popularity. Conversely, President Barack Obama, who had also been popular after spending some of his childhood based in Jakarta, used his influence to press regional leaders on human rights concerns and towards the end of his term refused to engage Philippine President Rodrigo Duterte after his more colourful commentary. Many in the US know this. Back in Washington, an alarming report from the New York Times earlier this month shows this disinterest is rife within the entire administration. Staff at the State Department are leaving in droves and sounding the alarm on the way out the door — there's inward-looking foreign policy and then there's plain old negligence. The Times reported Senator John McCain and Senator Jeanne Shaheen, a Republican and a Democrat respectively, had sent a letter to Secretary of State Rex Tillerson highlighting concerns held by both sides of politics. 'America's diplomatic power is being weakened internally as complex global crises are growing externally,' the letter warned. While this is no doubt alarming, the opportunity for Australia is a silver lining and something both the government and opposition clearly want to capitalise on. The bones of the foreign policy white paper, released last week by Foreign Minister Julie Bishop, have been picked over by the country's leading international relations thinkers and the consensus is clear — the timing is right and we must act now. "For all its rhetoric over decades, Australia must now take responsibility for this power vacuum, lest we lose out to disengaged superpowers with questionable motives." The benefits to deeper and more meaningful engagement within the region impact both Australian and Southeast Asian communities. Australia's stated goal of 'leadership' within the region, no matter how vaguely defined, requires a multi-pronged policy utilising hard and soft powers. For everyday Australians, this brings job opportunities in many of Australia's strongest trade industries, but more importantly engagement produces soft power relationships through sports, language education and plain old good will as the whole planet undergoes a rapid transformation in world order. For the communities abroad, deeper Australian engagement in the region brings, ideally, more aid funding to plug healthcare and education gaps. A stronger Australia is also in a far better bargaining position when it comes time to advocate on behalf of those unable to do so, including the Rohingya people of Myanmar and those suffering under Cambodia's increasingly authoritarian government crackdowns. Without Australia building on its place in this space as the US looks as though it is pulling out, the whole world loses out on these important relationships and developments. For all its rhetoric over decades, Australia must now take responsibility for this power vacuum, lest we lose out to disengaged superpowers with questionable motives. Under the current government, Australia has few leaders capable of both developing that vision and seeing it through to execution. Turnbull, preoccupied with maintaining control over his own leadership, failed to signal to Australians back home any sort of policy priority or reaffirmation of our place in the region. Instead, he was widely lampooned for confessing to never having eaten a banh mi before visiting Da Nang — an affront to multicultural Australia where the sandwich has been a lunchtime favourite for years. Meanwhile, over the years Bishop has expertly teamed up with her Indonesian counterpart Retno Marsudi to navigate the bumps in the Australian-Indonesian relationship following years of tensions, including the spying scandal and the execution of two Australian nationals, and the pair has overseen the most robust relationship in decades. She appears to be perfectly comfortable jet-setting to summits around the world and has, although this is an impossibly low bar, never been busted on a hot mic laughing about the desperate fate of Australia's neighbours. But with the writing on the wall for the next election, it is unlikely Bishop has much time to roll out the priorities set out in the white paper which will certainly be her strongest legacy. The first foreign policy white paper in 14 years, the vision it offers is unlikely to differ from that which a near-inevitable Labor government would prefer. The key concerns the paper is built around — terrorism, climate change and erratic shifts within the traditional world order — will not change regardless of who is at the helm of the country. Disappointingly, the paper touches only briefly on soft power and does not develop beyond common wisdom. It is in this space that Australia has the most to offer the world. There's a lot preventing us from being a major power: we're geographically away from much of the action, our population is relatively small, and getting onto the world stage is not a priority for voting Australians. But our soft power could be a game-changer. Australia's brilliantly diverse communities of Asian diaspora must be effectively engaged and utilised to build stronger links between their home countries and the wider region. But first, Australia needs a leader willing to put the work in. 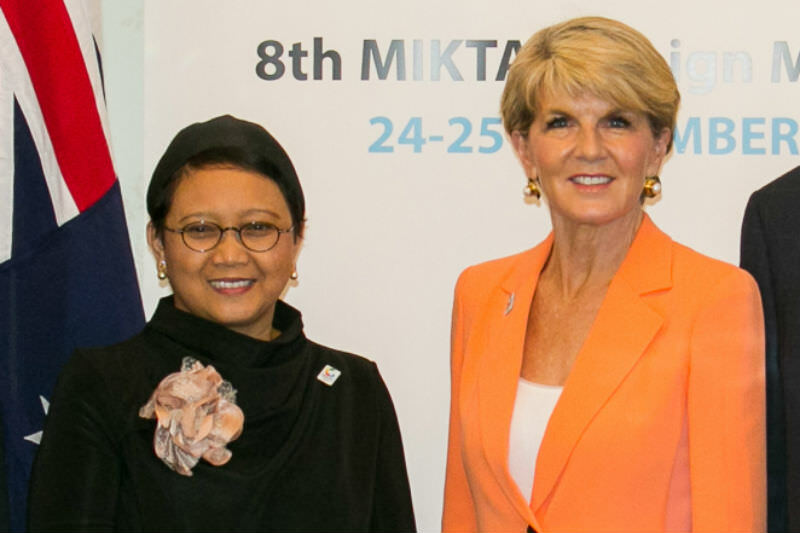 Main image: Indonesian Foreign Affairs Minister Retno Marsudi with Julie Bishop during the 2016 MIKTA meeting in Sydney. The White Paper not only lacks an emphasis on diplomacy it is contradictory. Malcolm Turnbull emphasises the need for Australia to be more self reliant yet alerts us to the prospect of a greater US military use of our territory. If the US is going to withdraw from the Pacific I think we must breathe a sigh of relief. Look at their influence in the Middle East, in SE Asia and South America. What we need more than anything is a stronger internationalism with cooperation on climate change, economic justice and non violent conflict resolution. In part due to my service in Vietnam during the war, I developed a keen interest in Asian affairs on my return to Australia, with regular trips to the region. Sadly our foreign policy has been in lockstep with US interests since the call by Curtin to the U.S. during World War II. Sadly that has led to unwise decisions , including Vietnam. It appears that we have been caught out by the emergence of China as the new regional power. Our dependence on China for the sale of our resources, yet our fear of China, going back to European Settlement has left us in a policy vacuum on both sides of politics. Donald Trump's ignorance of Asia, evidenced by his aggressive approach to North Korea, sadly has the support of our politicians. I suspect a lack of real knowledge of Asia combined with a lack of education about the region at school level, is compounding our society's problem in relating to Asian cultures. I strongly support Erin's suggestion that we more effectively engage the Australian Asian community in our midst. They have plenty of good advice to share. Offering a reasoned regional response to the refugee exodus would be a good place to start! If only International Relations were so simple. I have over many years met quite a few career officers in the Department of Foreign Affairs & Trade, and worked with them on several occasions. They were without exception highly intelligent men and women as one would expect given the rigorous nature of DFAT recruitment. One doesn't have to be in their company for long before one realises that even the international relations between Australia and one other country involves a plethoric multiplicity of interacting variables. A DFAT research officer, or a team of officers, working on Australia's relations with India, for example, might produce a brilliant comprehensively researched paper on the pros and cons of an Australian company selling coal to India but in the end they know when the paper reaches the Minister's office any decision about what the government should or should not do is a matter of politics. And not just domestic politics - although that is always a factor - but also how the decision will affect relations with other coal-exporting countries. How an Australian politician perceives the political implications will not always be as detached and objective and wise as that of a career diplomat. Australia could be a game changer in SE Asia, but we have leaders who are a long way off even thinking about changing things for the better in this part of the world. There are many reasons for this. First, many of our leaders see Asia in the same terms as imperial Britain did with all the paternalism towards Asians and the desire to rip off their resources. Second, after WW2, Australian leaders have followed the US policies in dealing with Asian nations. This saw us getting involved in the US wars in Korea and Indochina (and then later Afghanistan, the Gulf War, Iraq, Libya, Syria etc) Third, our leaders lack a commitment to social justice, equality and human rights and they have tended to go along with the dictatorships and human rights abusing regimes in the region that are sanctioned by the US. The support of General Suharto's dictatorship while the Indonesian military (TNI) committed genocide and massive human rights abuses in West Papua, Acheh, East Timor and Indonesia itself is a case in point. Fourth, our leaders also support the big corporations that want to exploit Asian nations for their profits - eg the refusal to recognise the law of the sea mid-line maritime border with Timor-Leste so that Australia and energy corporations are ripping off this tiny nation's resources which are badly needed to rebuild and develop after 24 years of the TNI occupation. We need leaders who are dedicated to social justice, human rights, fairness between nations and care for the environment if we want to contribute to making positive change in SE Asia. Asians don't expect much from our leaders and they know that our leaders do what the US dictates.